The 2008 Presidential Campaign is very different from any in the past, and it’s not only because of ethnicity and gender. 21st Century marketing techniques are being employed and many are taking notice… are you as a fitness professional taking notice? What I’m talking about is the Obama Campaign and their tactics to reach potential voters. They have done the old school stumping to “get out the word”, but the have also embraced nearly every form of media to spread the message as well. He has definately embraced new school marketing techniques and it apparently is making a difference. Chris O’Brien of the IdeaLab commenting on what the news media can learn from the Obama Campaign – “That’s an important lesson that every newsroom should learn. During the past year of research for The Next Newsroom Project, we identified six principles that newsrooms should adopt. One of those calls for newsrooms to embrace all platforms. It’s not enough to simply say, “Hey, we want to be online first.” Instead, think about how to use all platforms equally: mobile, the Web, print, broadcast (radio and TV). And be ready to experiment with any new ones that come along, including video games. From total views to number of subscribers on You Choose ’08 (at youtube) — the presidential election channel that launched in March ’07 — Obama wins by a landslide. The Obama campaign probably conducted the most prominent mobile efforts during this election cycle. Over the summer, users were invited to provide their mobile numbers on BarackObama.com in order to be among the “first to know” about Obama’s VP pick. Response to that effort was generally positive. Both candidates are well-supported by organic [search] listings; overall, however, official Obama sites still generate six times more traffic than McCain’s do. Facebook let loose its own 2008 Presidential Election application, with election news updates and debate groups. Through a partnership with ABC, the socnet’s youthful user base can follow reporters’ articles, videos, and blog posts from the campaign trail. BTW – Our Fitness Pro Travel now has a Face Book Fan Page (as of yesterday) – Your Invited! The take home message in all of this is that Barack Obama, in his bid for Presidency has used all tools available to “market” and reach out to his potential voters. You, the fitness professional, need to do as Barack did and utilize the multiple platforms to market your message. Your potential prospects are changing in where they get their discission making information. Are you there with them? Methods for spreading your professional news, events and information to current and potential clients has changed immensely over the past 8 years. Within the fitness industry, just like every other industry, technology, the internet, and social media has changed the the way we must market ourselves and our services. While the Outbound marketing techniques can still be effective, the consumer/client has many options/tools for shutting you off before you get to first base. They may use tivo to pass by commercials, caller id allows them to screen the calls, direct mail and insert advertising are physically easily tossed, and simple pop up blockers to steer away from a web based pitch. You are losing the marketing control as they have more tools to help with their marketing control. Inbound marketing options are many. Actually, it’s amazing at the number of options. Primarily we accomplish this drawing of people in via Blog, SEO (search engine optimization), and Social Media. Each of these has multiple methods for “pulling” people into your message. There are companies and individuals who make careers out of specializing in any one of these inbound areas. I am not one of them, but I have spent some time absorbing some of their techniques through research, networking, and educational programs. While SEO is a continually changing specialty it is a design issue for the most part. Blogs will draw people in but are also influenced by SEO and technical networking. Now on the other hand, social media you can have a great influence, when done correctly. You can elicit this influence without significant technical skill or marketing expertise. Heck, look at Tila Tequila (I think)… whatever her name was. She was the most befriended person/account in myspace. She may have used her personal assets to help her along the way, but without a significant marketing background she was able to utilize social networking skills which later developed into multiple revenue streams and even getting her own t.v. show. Her reach was to millions of people with a simple click of a mouse. 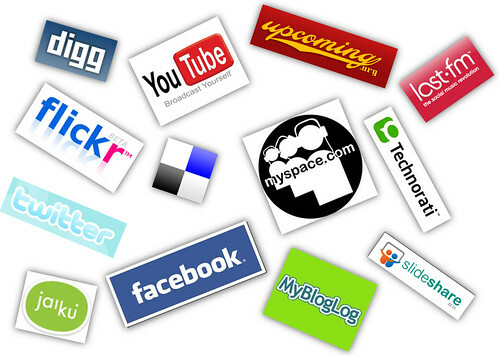 Here are a few tips you can utilize that will help you in building your social media presence. These are generic to the majority (ie facebook, twitter, linkedin, etc.). Do realize that each of these does have it’s own idiosyncrasies that should be considered and taken advantage of. Set up your accounts – Yes, that is plural, I’m suggesting you create accounts at multiple sites, and it does start with actually setting them up. Personalize your accounts – Whether all business or all personal or combination. Start with a photo and build. This is a little nerve racking if you, like I, were born a few years before the myspace generation. It is necessary though if you want to be trusted and followed by others. Connect with others – Personal friends, colleagues, classmates, and clients. This is the starting point. Using various site search features your next step is to find individuals or conversations that are in your industry. Join in and make new friends. Think cocktail party or back yard BBQ. Engage in the conversation – This is often your give to others. They will be pulled into your message by your useful or interesting input. That personalized account is what they will come back to for your details. This is the pull of inbound marketing. Law of RECIPROCITY – When we engage it is a piece of our GIVE. When we give to others, they will generally want to or will feel they should give back. This makes sense when we look at it with our students or clients. We provide better customer services (give) than the next guy, and often that client wants to give back by sticking with you or actually practicing your advice. Give first and opportunities for message broadcasts will later. Inbound Marketing is effective, can have a huge reach, and can even be viral (if you are not familiar with it, viral with a message in social media is a very good thing). Additionally, your kids may be able to give you the majority of the social media marketing advice necessary to get you started. If you have to dig in and spend the day (it won’t take longer than that) to learn it yourself, not a big deal. Most all are free or have free options. If you are new to using these types of social media websites or still have no idea how to do it, why to do it, when to do it, etc. I’d love to hear your reasons. If you throw me some specifics I’ll address them in future blogs or interview someone who knows more than I to share with this group.